AUTOSTEM Coordinator Dr Mary Murphy and PI Prof Frank Barry amongst many other NUI Galway researchers participated at the Galway Science and Technology Festival Exhibition Day on Sunday, 25 November 2018. The AUTOSTEM display in the Bailey Allen Hall of the National University of Ireland Galway exhibited models and props which helped to explain osteoarthritis disease and future plans for cell therapy to a young audience. A set of stir tank bioreactors was on display to illustrate the technology required to produce large batches of human bone marrow-derived mesenchymal stromal cells (MSCs) for use as a cell therapy. 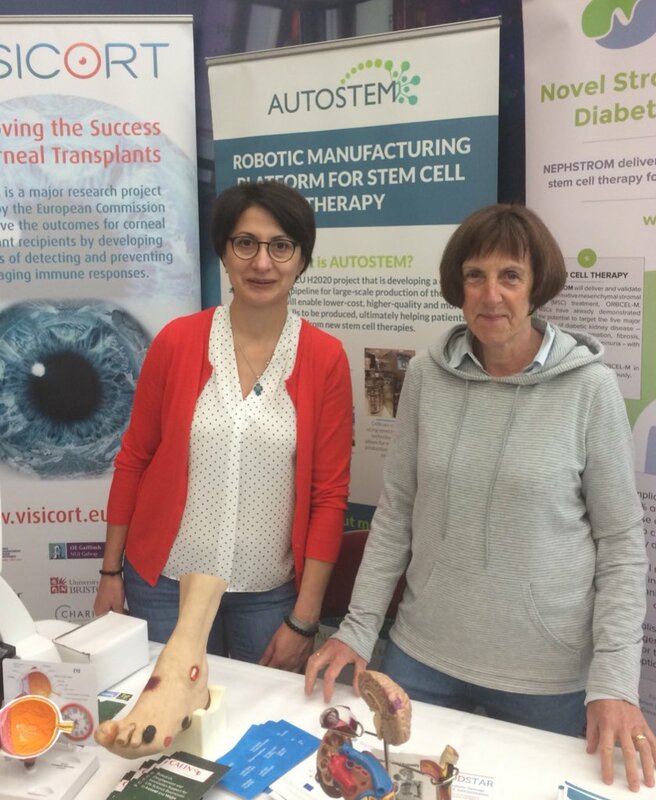 Pictured above Drs Eka Mukeria and Mary Murphy, NUI Galway at the AUTOSTEM display. This entry was posted in Dissemination, News. Bookmark the permalink.